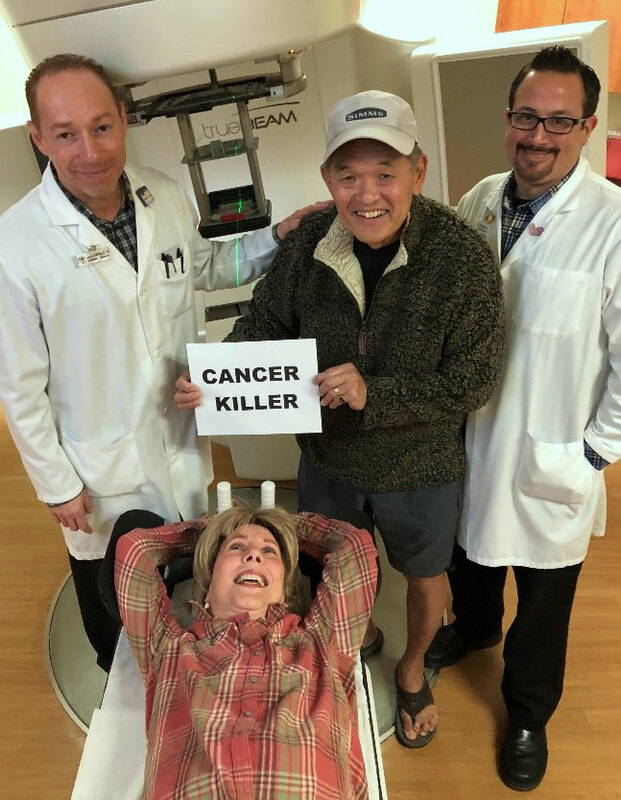 This past Tuesday morning, right after Ken and our technician-friends, Jason and Steve, lifted me on the radiation table to be zapped, my radiologist stepped in and took a look at my chest wall. One glance at the red, weepy skin, and he canceled the session. What’s more, he canceled the rest of this week’s treatments to give my skin a long rest. Yes, I was a bit disappointed, but come Monday morning, I will go in for the next and 7th session – which delays everything a week. But that’s okay. My skin has a chance to catch up and enjoy its soothing, Silvadene plaster every morning. My doctor’s best words? “If your healthy skin looks this bad (and it will easily repair itself), then you can be sure we are killing the cancer. Healthy cells have the mechanisms to repair themselves. Cancer cells do not. All they can do is die.” That made Ken and me smile. So I hope to finish a couple of days into the week of February 25. I will then reward my skin with a spa and steam bath :-). It’s been a long haul, since I’m still struggling with pain issues and not always sleeping well. But we trust the “God who gives all endurance and perseverance” (Romans 15:5). It’s why I was so blessed by this article “Lord, Help Me Endure One More Day”. In it, the author explains that if you want to fail at scaling a high, rocky, snow-covered mountain, stare at the top. But if you want to succeed, find the nearest tree and work your way toward it. Once there, catch your breath, look for the nearest tree further up, and work your way toward it. Eventually, that way you will get to the top. It’s great advice for those who live with hard affliction. It also helps to have friends like you who pray. Ken and I just couldn’t do this were it not for your faithful intercessions. God bless you for helping us endure. And thank you for praying come Monday morning.